The declaration on November 9, 2016 by our dear Prime Minister has definitely brought a huge curve on the lips of common man. In Sushmitamalakar blog, appreciates this move and completely supports this decision! Narender Modi just converted all his intellectual haters to his admirers. And yes, this seems like the most effective measure that Mr. Modi has taken for the development Indian Economy.But it is a genius plan! Announcing the ban suddenly and literally giving no time to the money launderers to react – nothing can go better than this. And this, evidently, will also capture all the black money floating around. Excellent plan and I am already in love with it.Even before I could grasp and come into terms with this announcement, my social media feed had already flooded with some indigenous and not-so-originals feeds. Everything has its pros and cons, and this act of stripping the currency had some heinous effects too , on sections of the society. The Relishingrascal blog, highlights the positive and negative impact of this resolution. Take a look! Forwarded message on Whatsapp, Prime Minister while addressing the nation made a announcement that from Midnight Nov 8, 2016 today, Rs 500 and Rs 1000 notes are no longer legal tender.“You have time period of 50 days (From 10 Nov to 30 Dec) to submit your currency notes of 500 and 1000 in nearest post offices,” he said. After reading this you are like, kuch bhi! But the local cab driver that refused your 500 hundred notes hits you like a huge Stone on your head! Well, the news was real and suddenly your heavy wallet that just five minutes back was considered as a small fortune, now seemed to be a thrash full of waste papers! Well, that happens when money loses its value. This huge sudden decision that was immediately put in to impact by crores of Indian had some great effects while it had its own serious drawbacks. Apart from your social sites being spammed by number of funny and serious messages about this announcement, the stress level of getting these now not at all useful notes converted in to useful ones was large! When the act of demonetization flared up, the citizens of India adapted this change very swiftly. The cards were swiped more rather than exchange of notes. Observations in our day-to-day lives is perfectly enunciated in Anandkumarrs blog! As people across the entire nation queue up to exchange notes of Rs.500 and Rs.1000 there are still few people in the society who find this as a big task. Then, online payments comes to rescue. The impact on the life of a woman who handles her household chores is talked about in the Numerounity blog! Tell me your favorite currency note? I am sure a lot of you would reply- Rs 500 or a Rs 1000 note. But off course, given the higher value, the joy of seeing, receiving and owning these two denomination would be greater than any other note. Not any more.In a historic turn of events, Indian PM Mr. Narendra Modi in his speech last night, in an attempt to curb the curruption in the country, dramatically and yet thoughtfully, demonetized the 2 currency denomination. Logic? Well, the simplest rationale is to create accountability for the “recoverable” black money, fake currency and bring more transparency in to the cash transactions in the country. [read it as- making your incognito currency, bank worthy].The announcement came heavy and totally taxing to a majority of unassuming viewers. I mean, you cannot make one oops two of the most valuable notes redundant just like that! Especially after Diwali and wedding festival when every one is smelling the valuable green currency for their upcoming shopping needs. The Padmum blog talks about the money hoarders, as to how this move has left all this money laundering in a shock. A lot of appreciation is bagged by the current ruling party under the rule of NaMo. The common man supports this new addition and is ready to take all efforts to support this movement! The sudden and swift move has caught all hoarders of black money unawares providing no major loophole to protect their holdings. Their opposition to the Government’s deft move is understandable. However PC is no ordinary person. He is a Harvard alumnus, top Supreme Court lawyer, former distinguished Finance Minister whose views and advice are sought by top business houses. He has an impressive following. His criticism of the Government’s demonetization move is surprising, in view of his intimate knowledge and hands on experience. He says he is perplexed. It is not clear why he has chosen to echo the seemingly inane arguments of his fellow politicians on this occasion. It is necessary to examine the arguments and assertions of this legal luminary. With every change in the current scenario, we the citizens of India also need to do our bit. After all, this is done for the benefit of us citizens. Our duty is to fulfill all the requisites and be calm and patient. For the evolution to be successful, we the people of India need to indulge in all required practices for a better tomorrow, says the Adsunsri blog! By the time, my readers read this post, the brouhaha on the withdrawal of our Indian currency in the denomination of 500 and 1000 would have tapered off, but for the political class who do a double take with their dropped jaws will remain locked with the bombshell.Not to be left behind in this real exercise of cleaning up the India acts, husband and myself did our bit, like all ordinary mortals, to contribute to being responsible and upright citizens. Our nation rebuilding process started with a visit to the bank and a long serpentine queue, normally seen in temples like Tirupati, welcomed us. We noticed that there were multiple queues within the main one and scores of people crisscrossed with the semblance of a railway junction. As we stood, blowing hot and cold, clutching the once sacrosanct, now defunct legal tender, a bank official distinct with his neck tie and identity card made himself visible to guide us like the ship’s beacon in stormy waters or maybe an orchestra conductor minus the baton. The baton was however compensated by a posse of policemen deputed to hold back the surging crowd, eager to lay their hands on the new Gandhi embedded in the purple avatar! The demonetization effect sent thrills in the lives of homemakers. The note change saga has left no stone unturned, let’s read from a house wife point of view. The Itsaboutmypassions blog emphasizes on the problems the house wife faces! There are 2 words that have sent shivers down many a spines in the last week -demonetization and Trump. 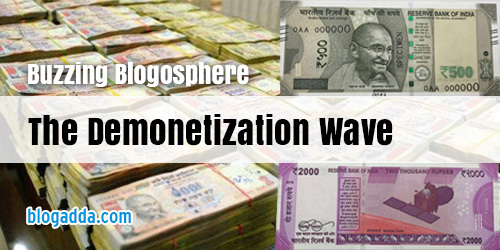 This post is about the former; of course my opinion on demonetization is of little or no consequence. Okay, no consequence. What I did see was about how deeply women felt about the money. Not husband’s earning. Money that they’ve save up. I’ve been a stay at home wife for a bit (5 months) and I am open about how I felt. I’ve been without a bank account too (because I couldn’t get one). I’ve been without my “own” money. The thing is, I’ve always had my own money. Starting at the age of 7. My mother started giving me Rs.5 every month and I had a small purse that I saved money in. I also had a small piggy bank that held cash I often asked from my grandparents. With 4 adults at home, I found quite a few coins in the couch, on the fridge and in pockets. I had a finders keepers rule – my parents actually appreciated it. I remember, one year I ended saving a little over 500 Rs! I gave my mum the coins or she took it added some cash and put it away. When I came of age, she had a spot of cash to put into my SB! After this act to make India corruption free. The black money hoarders are most talked about. After all, this movement’s motive is to make India corruption free. The Gahrana blog lists down some places where the black money is easily converted into white, which needs attention by our government! Well amigos, this is all for today’s Buzzing Blogosphere where it rained all money and effects of demonetization. Stay tuned till we return with our news letter for the next time. 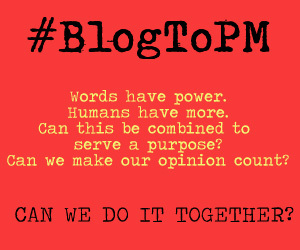 Till then keep blogging your thoughts and views on the current scenarios. 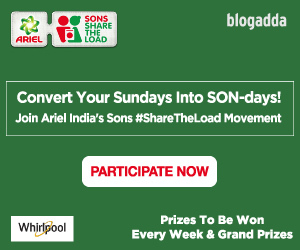 We would love to read and feature them only at BlogAdda. Happy blogging! Next PostNext Winners Announcement: A Letter To Life – #DearZindagi Activity!